My original 1973 Pontiac LeMans was purchased new, by my father, I assume in late 1972 when the new models came out, or early 1973. My guess is that he probably bought it from the Pontiac dealer (McCaddon?) in our home town of Boulder, Colorado. List price at the time was probably between $2,500 and $3,000. 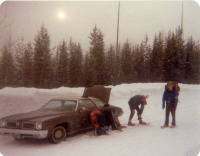 The 1973 model was new from the ground up, with new features including 5 mph 'no-damage' bumpers and single headlights. The handling was much improved over prior models due to new front suspension components brought over from it's sister cars the Firebird and Camaro. This was a base-model (not a LeMans Sport Coupe, GTO or Luxury LeMans with the louvered back seat windows) yet still came with what today would be a huge 350 cu. in. (5.7 litre), 150 hp engine with a two-barrel carburator. The transmission was a 3-speed automatic. My father used the car mostly for commuting to his job 30 miles away in downtown Denver, and so put a substantial number of miles on the odometer. It was never in any accident that I was aware of. 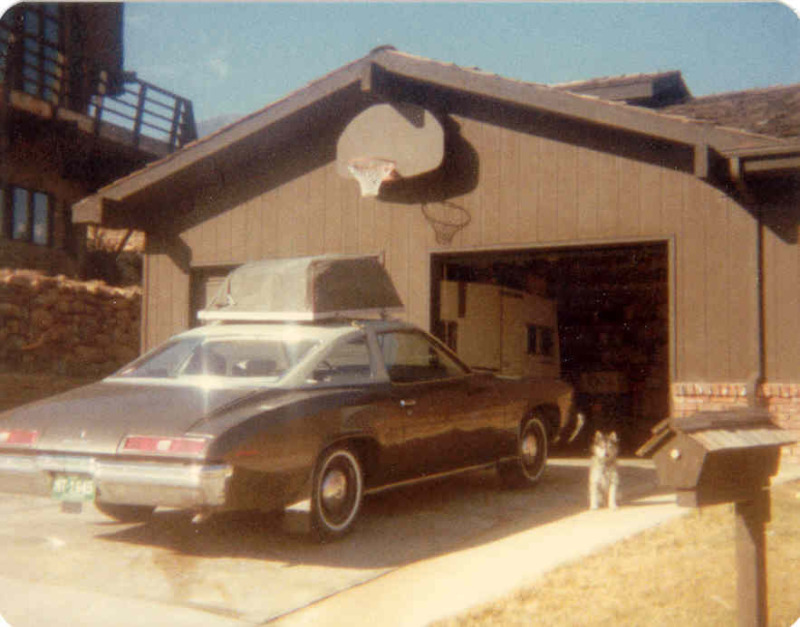 In the summer of 1977 I had completed my first year of college in Spokane, WA and was earning enough money over the summer to buy a car. I believe I paid him $500 for it, and the car probably had around 80,000 miles on the odometer at that point. 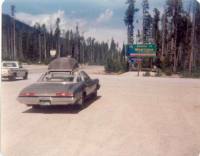 The picture above was taken in late August 1977 as I was packing to return to Spokane for my second year, this time with a car for transportation instead of a 10-speed bicycle. (The object on the top is a Korean War-era military type canvas car-top carrier. Years later while driving between Billings, MT and Sheridan, WY the carrier died an ignoble death after detaching from the roof at highway speed and flying into the ditch with it's load of suitcases). Over my final three years of undergraduate school in Spokane, I drove the car back and forth between Boulder and Spokane, through Montana, Wyoming, Idaho, Utah and Oregon, every summer, spring break and Christmas. I also did a fair amount of exploring in my free time. The car made it as far west as Seattle, WA. As far north as Edmonton, AB. As far south as Denver and as far east as Brush, CO.
On May 18th, 1980, I graduated from college in Spokane and that afternoon the ash from that morning's eruption of Mt. St. Helens 200 miles away smothered the city. For the next few days, before I left the city to move back home to Colorado, I drove the Pontiac through clouds of abrasive volcanic ash. Fearful of hurting the engine, I changed out the air filter every 50 miles or so. Nevertheless, the next winter (1980-81), when I was living in Calgary, AB, one of the front wheel bearings siezed up and welded itself onto the spindle. 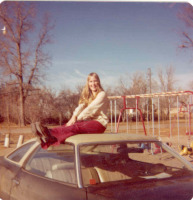 I studied up and learned how to replace the spindle with that of a taxi from a junkyard, but, fearful that this was just the beginning, I drove the car back to Denver and my dad sold it for me. I always figured that the volcanic ash played a part in the failure of the wheel bearing. The car had also been ill-treated in Calgary. Parked on the campus of the University of Calgary with Colorado license plates, someone had come along and kicked out the rear plastic tail light covers. These were too expensive for me to replace, so I could only tape red cellophane over the gaping holes. Also, during a big Calgary snowstorm, someone skidded into the car while it was parked on the street outside where I was living. It was a hit-and-run, so there was no compensation and I was left with both the rear bumper and quarter panel significantly dented. The car ran beautifully the whole time I had it and I remember virtually no repairs. It's only idiosyncracy was that it tended to stall in the first few minutes after being started in cold weather. My dad had come up with a 'fix' for this, which was a section of bicycle tubing about 3 inches long. When the car stalled, you had to get out, open the hood, remove the cover from the air filter, stuff the bicycle tubing into the carburator to keep the butterfly valve open and return to the car, whereupon it would start again. It wasn't any fun to have to do this every cold morning at the first stop sign you hit. After I bought the car, my mother insisted I take an auto repair course at the local vocational-technical center and this was extremely valuable to me. I learned to replace brake pads and bleed the hydraulic systems, to do tune-ups, to replace water pumps and radiators and a few other helpful things. I did my own oil, oil filter and brake pad changes (disk and shoe) and thus saved myself a lot of money over the years. But by no means did I get comfortable enough with it all to became any sort of gearhead. The car was GM India brown in colour, with a beige interior and a beige vinyl roof. A full bench seat in front and gear shift lever on 'the tree.' The only changes I made were seat covers, a leather steering wheel cover, an under-dash cassette player and a set of speakers in the rear deck. Approximately 250,000 1973 model Pontiac LeMans' were built. Apparently a large number of them were assembled at a plant in suburban Atlanta. Mine was sold to someone in the Denver area and so it's likely that it ended up in a scrap yard somewhere in that metro area. It had about 120,000 miles on the odometer when I sold it. Below are all the surviving photos I have that include the car.